In Greco-Roman geografie, Iberie (Greek Ἰβηρία, Georgie: იბერია)[needs IPA] wis the name for a kinrick o the Southern Caucasus, centered on present-day Eastren Georgie. 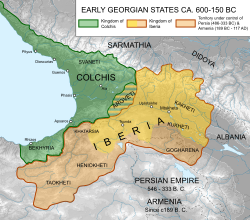 Iberie, an aa kent in Georgian as Kartli (Georgie: ქართლი), efter its core province, wis during Classical Antiquity an the Early Middle Ages a signeeficant state in the Caucasus, aither as an independent state or as a dependent o lairger empires, notably the Sassanid an Roman empires. Its population, kent as the Caucasian Iberians, formed the nucleus o the Georgie fowk (Kartvelians), an the state, thegither wi Colchis tae its wast, wad form the nucleus o the medieval Kinrick o Georgie. The term Caucasian Iberia is uised tae distinguish it frae the Iberie Peninsula in Wastren Europe. ↑ Ehsan Yarshater (1983). The Cambridge History of Iran: The Seleucid, Parthian, and Sasanian periods. Cambridge University Press. pp. 520–. ISBN 978-0-521-20092-9. Retrieved 18 September 2013.